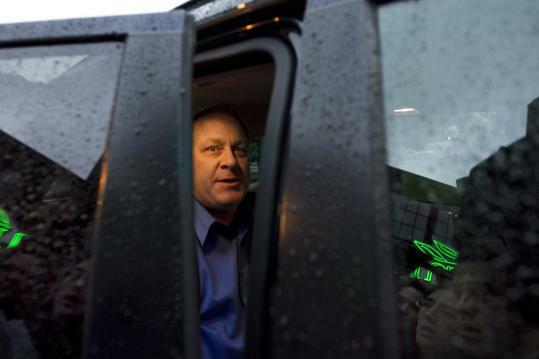 Late on the afternoon of May 16, Governor Lincoln Chafee of Rhode Island braced himself for a full-on sales pitch from Curt Schilling, the gregarious former Red Sox ace who had talked the state into loaning his video game company $75 million. Schilling’s firm desperately needed more money, and this was the day for him to make the case. A few days earlier, the company, 38 Studios, had without warning failed to make a $1.1 million payment to the state, so Chafee convened an emergency meeting that afternoon with his business development council to hear how Schilling would save his company, and why Rhode Island should give it millions more. At that meeting and a follow-up on Monday, Schilling’s presentation was singularly underwhelming. The normally buoyant Schilling seemed devoid of enthusiasm, the governor said, his salesmanship was unconvincing and his plan to rescue the business seemed unrealistic. “For all the board members, there was a feeling that we needed to be sold,’’ Chafee said in an interview with the Globe Thursday evening. Schilling’s performance that afternoon was one of several signals that eventually convinced Chafee there was little he could do to help save 38 Studios and there was no point in throwing good taxpayer money after bad. The stunning collapse of 38 Studios, which spent years developing its products, took barely three weeks: In late April executives assured Rhode Island officials they were on schedule to pay their bills; on Thursday they dismissed the entire workforce, about 400, and now seem all but officially out of business. As swift as it was, the collapse was marked by a near blackout on reliable information about the company’s finances, and what Schilling and other executives were doing to save it. Chafee said he was “stonewalled’’ by company executives, and even 38 Studios employees had no inkling of trouble until May 15, when their paychecks did not arrive as scheduled. The normally garrulous Schilling, who has assiduously cultivated a high profile in the media, has been notably silent in public. He did not make himself available for questions after either of two meetings with Chafee and other Rhode Island officials, and has repeatedly rebuffed direct requests for comment. A spokesman Friday reiterated neither 38 Studios nor Schilling would comment. What little the former baseball star has said has come in inspirational notes to employees and fans issued through social media outlets. “God Bless you and thank you to everyone sending thoughts and prayers to the team and families of 38 Studios,’’ Schilling wrote on his Facebook page Friday. Employees, meanwhile, seemed shocked by the rapid end of what had been for many a dream job building a sophisticated game for good money. Several interviewed by the Globe expressed alarm and frustration at the way Schilling and their bosses were handling the situation. After not being paid on May 15, 38 Studios officials held a series of hastily arranged meetings with employees, sometimes several a day, and each time the overall message was that the company was going to pull through. But employee anxiety began to heighten later that week when Chafee revealed publicly that 38 Studios’ upcoming game, nicknamed Copernicus, would not come out for at least a year. Such information was a closely kept secret within the company, but Chafee telling it to the world suggested to some employees that the state was not eager to help save the company. Video game consultants who advised Chafee told him that 38 Studios had not developed a large and loyal fan base with its first product, Kingdoms of Amalur: Reckoning. Chafee said the game, which sold 1.2 million copies, did not establish “emotional attachment’’ among fans that would help build excitement for its next and grander venture, Copernicus. Schilling has rebutted Chafee’s claims on Facebook, saying 38 Studios’ first game was a success. 38 Studios relocated from Maynard to Providence in 2011 after Chafee’s Republican predecessor, Donald Carcieri, agreed to provide the company with $75 million in loan guarantees as part of a broader effort to jump start a video game industry in Rhode Island. At the time Chafee was running as an independent to replace Carcieri and criticized the deal as a foolish giveaway to an untested entrepreneur. While Chafee’s warning proved prophetic, he is now the one who has to pay Schilling’s debt as Rhode Island, already strapped for cash, is on the hook for the loan to 38 Studios. The day after Schilling’s first underwhelming presentation to Chafee, disaster struck in a most public and embarrassing fashion. The company delivered its late $1.1 million payment to the state, only to have Rhode Island officials learn that 38 Studios did not have enough money in its account to cover the check. The state promptly returned the check. Then on May 18, 38 Studio executives held another companywide meeting with employees. This time there was no air of optimism - an abrupt culture shift - and employees were told they should brace for furloughs. One worker told the Globe that when a co-worker at the meeting asked for a fuller explanation, executives said the furloughs were a way to avoid terminations. The answer seemed to leave the workers in shock, said one employee, and soon after the mood throughout the company quickly soured. Many began to prepare their resumes, even though later that day Chafee provided a fig leaf of hope when he said Rhode Island may have no choice but to provide 38 Studios with millions of dollars in state tax credits for which it appeared to have qualified. But the situation did not improve after the weekend. Chafee and his economic development board met again on Monday with Schilling but made little progress on a solution. The next day Chafee adopted a more sharply critical tone, and sounding evenmore pessimistic about the company’s chances, the governor said he was holding off on releasing some $8 million in tax credits because he was unsure 38 Studios would survive. That same day 38 Studios employees were told their health insurance would expire in two days. In his interview with the Globe Thursday, Chafee seemed to have arrived at some finality about what to do with 38 Studios. Calling himself a realist, he said he could not in good conscience give the company any more money, even if that meant the end of the venture and a huge financial loss for the state. Around the same time, a few blocks away in 38 Studios’ office, employees were receiving the short e-mail that brought the last few weeks to a dispiriting conclusion. Hiawatha Bray, Mark Arsenault, and Todd Wallack of the Globe staff contributed to this report. Andrew Caffrey can be reached at caffrey@globe.com.